Pet Industry Spending at a Record High: $66.75 Billion! Bob Vetere, President and CEO of the American Pet Products Association, announced that overall spending in the pet industry has surpassed previous spending by more than $6 billion! In fact, pet industry spending for 2016 came in at a record high of $66.75 billion! There was a noticeable increase in pet food spending of 22.6% primarily due to APPA accounting for new data from the U.S. Bureau of Labor Statistics, which indicated previous spending figures released may have been too conservative. In fact, interest in high end, premium pet food and treats continues to be a key driver for increased spending in the pet food category. Veterinary care spending remains the second source of spending in the pet industry at $15.95 billion. While routine veterinary visits have not necessarily increased, new advances in health care and services available may be contributing to the 3.4% growth. And with new results from research compiled by the Human Animal Bond Research Institute showing that more people are becoming aware of the health benefits of their pets, it’s no wonder they are more likely to take care of them! The third highest source of spending is in supplies and over the counter (OTC) medications. $14.71 billion was spent on items such as beds, collars, leashes, toys, travel items, clothing, food and water bowls, and other accessories. Purchases of live animals decreased 0.9% in 2016. Other services such as grooming, boarding, walking, training, pet sitting, yard services and more saw significant growth from 2015, second only to the growth of the pet food category. If these new numbers are any indication of the direction the pet industry is moving, our future is certainly looking bright! Visit the press release section of our website for a full breakdown of our Annual Industry-Wide Spending Figures. Best Overall Single-Store Retailer: This award recognizes a single-store retailer for excelling in sales, customer service, store design, merchandising and community service. Best Overall Retailer (2 – 10 stores):This award recognizes multi-unit retailers with less than 10 stores for excelling in sales, customer service, store design, merchandising and community service. Best Overall Retailer (10 or more stores): This award recognizes multi-unit retailers with more than 10 stores for excelling in sales, customer service, store design, merchandising and community service. Best Live Animal Retailer: This award recognizes a retailer that excels in sales, promotion, display and knowledge of the dedicated live-animal category. Merchandising Excellence: This award recognizes their outstanding creative techniques to promote sales and services. Multi-Service Excellence: This award recognizes their effective offering of a broad spectrum of services including grooming, training, boarding, etc. Marketing Excellence: This award honors effective execution in sales and promotional techniques to increase sales and customers including the use of advertising, public relations, social media and more. Customer Service Excellence: This award recognizes an unmatched level of customer service, demonstrates familiarity with products and services, etc. Store Design Excellence: This award honors excellence in overall store design including merchandising displays, store layout, curb appeal and more. Community Service Excellence: This honor recognizes fellowship, integrity and a clear demonstration that the store is committed to giving back to the community. Entries were judged by a committee consisting of Global Pet Expo and Pet Business Media staff members. For more information about the Show, please visit www.globalpetexpo.org. Last chance to get your nominations in for the Third Annual Global Pet Expo Retailer Excellence Awards! 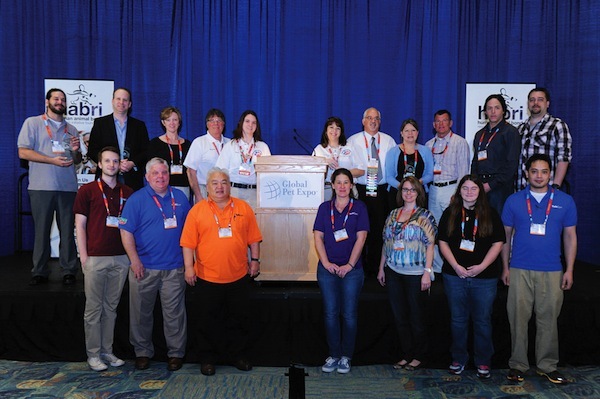 The awards program is designed to recognize outstanding pet specialty retailers in a variety of areas such as merchandising, marketing, customer service and community service. 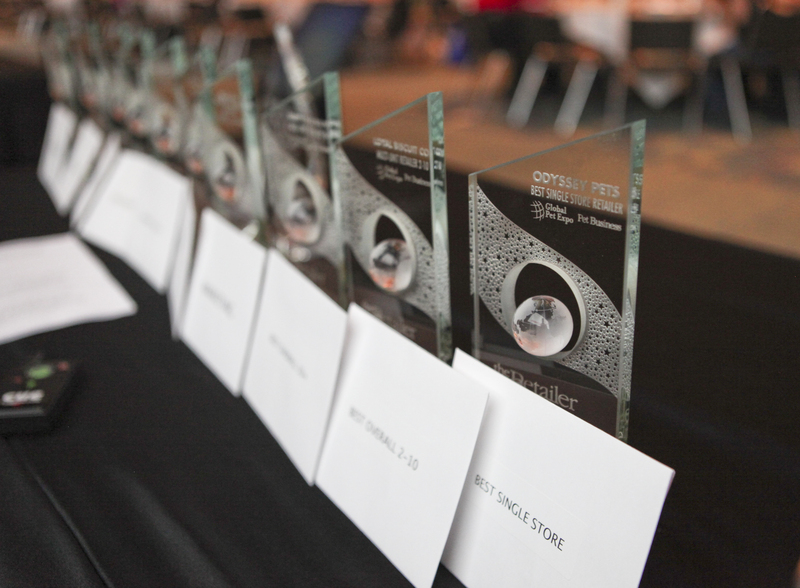 Winners will be announced at Global Pet Expo’s Pet Industry Breakfast at 8 a.m. on March 13, 2014. Nominations can be submitted by manufacturers, retailers, distributors, and members of the press. CLICK HERE to download the nomination form, which may be submitted via email at mdavid@petbusiness.com or fax at 646-674-0102. Last year’s winners posing at Global Pet Expo. Best Overall Single-Store Retailer: Recognizes a single-store retailer that excels in sales, customer service, store design, merchandising and community service. Best Overall Multi-Unit Retailer (two -10 stores): Recognizes multi-unit retailers with between two and 10 stores that excel in sales, customer service, store design, merchandising and community service. Best Overall Multi-Unit Retailer (10 or more stores): Recognizes multi-unit retailers with 10 or more stores that excel in sales, customer service, store design, merchandising and community service. Best Live-Animal Specialty Store: Recognizes a retailer that excels in sales, promotion, display, concern and knowledge of a dedicated live-animal category. Merchandising Excellence Award: Recognizes a retailer that demonstrates outstanding creative techniques to promote sales and services. Multi-Service Excellence Award: Recognizes a retailer that effectively offers a broad spectrum of services including grooming, training, boarding, etc. Marketing Excellence Award: Honors a retailer that effectively executes sales and promotional techniques to increase sales and customers including the use of advertising, public relations, social media and more. Customer Service Excellence Award: Recognizes a retailer that provides an unmatched level of customer service, demonstrates familiarity with products and services, etc. Excellence in Store Design Award: Honors a retailer that demonstrates excellence in overall store design including merchandising displays, store layout, curb appeal and more. Community Service Award: Recognizes a retailer that demonstrates fellowship, integrity and a clear demonstration that the store is committed to giving back to the community. Global Pet Expo is only five months away. “Only,” you might be saying? Yes, there are certain things you need to be thinking about and acting on now in order to make your Show experience the best it can be. #1 Reserve your booth space. Your Global Pet Expo experience begins when you reserve your booth. If you haven’t done it already, click HERE to book you booth on-line. Don’t wait too long because the show floor is filling up fast. #2 Look at your booth itself. Will you need a new booth, or do any parts need replacing? Does signage need to be updated or would you like different flooring than you had last year? Waiting until the last minute costs more and adds unneeded stress. #3 Decide who should work the Show. Decide now how many sales people (and which ones) should work the Show. Do you need to bring someone who can answer technical questions or someone who can speak to media and go on camera? Will you have a senior level person to talk to VIPs? Figuring out these issues now will let everyone attending plan ahead. #4 Book your hotel and flights. Now that you know who is going to Global Pet Expo, you should plan your trip. Airfares are usually cheaper when you book early. Also, fill up quickly. You have more options when you reserve your hotel rooms early. Click HERE for special hotel rates. #5 Start planning how you will promote your participation at the show. Marketing and advertising materials take a while to plan and produce. Are you going to mail brochures and post cards or will you do all your promotion by email? If you are placing ads in the pet industry trades find out the dates that artwork is due. The Global Pet Expo Show Directory and Show Dailies are a great way to get in front of Show attendees while they are at the Show. And don’t forget press kits for the press office. #6 Nail down new products. Are you launching something new at the Show? Make sure you’re working on packaging design and quality prototypes now that positively reflect the actual product if it won’t be available at the Show. Get with your team to have sales price, pitch and information clear, concise and consistent. To be eligible to win, products must be entered in the New Product Showcase. Don’t delay, the entry fee only goes up the longer you wait! When Global Pet Expo debuted in 2005, the Show boasted impressive numbers and set the course for unprecedented growth in the industry. From our humble beginnings a decade ago, Trade Show Executive Magazine now ranks Global Pet Expo as one of the top 100 trade shows in the nation. 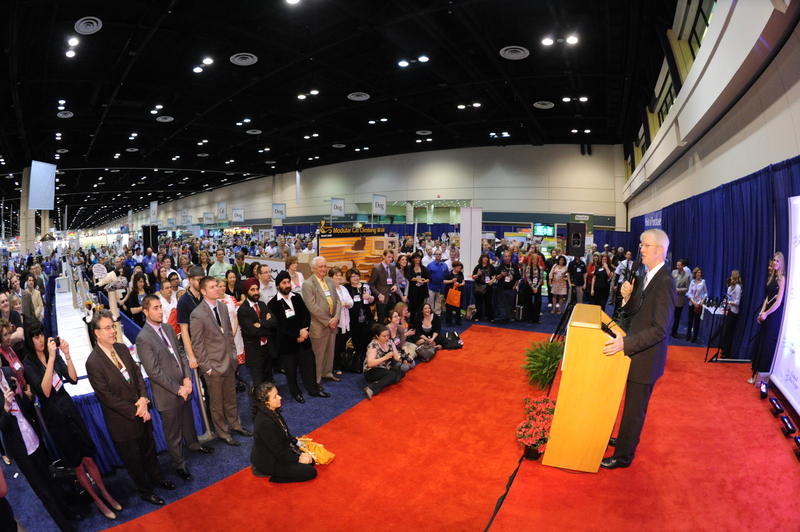 As we look forward to our 10th anniversary in 2014, we decided to take a look back on some of the most memorable moments that have made Global Pet Expo the standard in pet industry trade show excellence. The APPMA Show and PIDA Pets Show were combined and rebranded as Global Pet Expo. It would quickly become the pet industry’s largest annual trade show. During the 2005 Show, there were 66 International Exhibitors, 630 Domestic Exhibitors, 2,049 Booths and 4,365 Pet Product Buyers. The first ever “Excellence in Journalism and Outstanding Contributions to the Pet Industry Award ” was given to Dr. Marty Becker and Steve Dale for their lifetime dedication of giving animals and pets a voice in the media. Buyer attendance jumped 26%, and Tradeshow Week magazine named Global Pet Expo one of the 50 fastest growing trade shows of the year. The 4th Annual Allen Levey Golf Tournament, a popular pre-show event, was held at Torrey Pines just before the golf course hosted the U.S. Open. Global Pet Expo outgrew its convention space in San Diego and moved across the country to Orlando, Florida in the Orange County Convention Center. The Orlando convention space is one of the few in the country that is large enough to accommodate the Show’s yearly increasing numbers. The Natural Pet Section debuted on the show floor in response to the growing trend of natural, organic and holistic products for pets. In 2013, there were 150 booths in the Natural Pet section, the most ever in this sold out section of the show floor. For the first time ever we announced the New Products Showcase “Best in Show” award winners during a special ceremony on the show floor. As the largest showcase of new products at any pet industry trade show, Global Pet Expo receives nearly 1,000 submissions each year. The Retailer Excellence Awards debuted at Global Pet Expo and honored deserving independent retailers in a variety of categories. For the first time ever, NBC’s Today Show broadcasted live from the Global Pet Expo floor giving a national spotlight to the show itself and the amazing exhibitors at the Show. The 2013 Global Pet Expo was also the largest Show to date, breaking all previous records with 172 International Exhibitors, 964 Domestic Exhibitors, 2,686 Booths and 5,327 Pet Products Buyers. As advances continue through technology, products and services, Global Pet Expo remains the leader in annual pet industry trade shows. Join us at Global Pet Expo 2014, March 12-14, at the Orange County Convention Center in Orlando, Florida for our biggest and best Show yet!